For a couple of years now we have been asking Thoroughbred horsemen what they want in a leading sires list. The definitive answer has been fairly elusive because what’s desired depends on who is answering the question. A farm standing a sire whose progeny attract buyers from Europe wants to see European earnings included. If a young sire has a runner in Japan, then certainly the farm where he stands wants to see those earnings count, too. The Blood-Horse offers a lot of ways to view the data for a sire’s progeny. We publish 14 different sires lists daily online, excluding the battery of lists available for each racing state, U.S. region, and Canada. But the question is really about the list that determines the leading sire at the end of the year. Since 1976 The Blood-Horse has published weekly a leading sires list ranked by progeny earnings that included racing in North America and select countries in Europe (England, Ireland, France, Germany, and Italy). This collective of countries used to be known as the Big Seven. As the reach of American-bred horses grew, the sires lists statistics expanded in an effort to be more inclusive, but there were growing pains. Hong Kong and Japan were the key trouble spots. Japan for a long time was a closed racing community and only recently has begun licensing owners based in other countries. Hong Kong is also a very selective jurisdiction. Japan and Hong Kong both offered greatly inflated purses, too, compared with the rest of the world. Was it fair to include inflated purses when 1) the racing wasn’t really open to the world, and 2) relatively minor-quality races were paying huge purses that skewed the sires list rankings? In the end, we decided the list more accurately reflected market value by leaving these earnings out. Other exceptions were made, in particular to include the earnings from the Dubai World Cup program, whose seven group races are now worth $25 million. No one questions the importance of the World Cup program, but just about everyone questions the wisdom of including the earnings from one race that, again, disproportionately skews the rankings. Victoire Pisa earned $6 million for winning the 2011 Dubai World Cup sponsored by Emirates Airlines (UAE-I). By comparison, the 2011 leading North American sire Distorted Humor had just over $10.37 million in total progeny earnings. As of now, the total progeny earnings on our sires lists include all available Northern Hemisphere races with the exception of those in Hong Kong and Japan. The number of winners and stakes winners is worldwide. We think it’s time to regroup. Expanding the statistics shaping the sires list has been problematic and won’t become any less so by expanding further, even though some in the industry believe being more inclusive is better and endorse a worldwide list. Problems exist particularly with the Southern Hemisphere that runs a “split year” relative to the Northern Hemisphere racing calendar. By including Southern Hemisphere racing, our end-of-the-year statistics would include the Northern Hemisphere and half of the Southern Hemisphere racing calendar. That doesn’t seem right either. No other major racing countries include the racing statistics from outside their borders in determining their leading sires. Not England. Not Ireland. Not Australia or Argentina. Maybe we shouldn’t either. North America is our primary racing market. So here’s the proposal. The leading general sires list is still ranked by total progeny earnings but those earnings are only from races in North America (the U.S., Canada, and Puerto Rico). Total runners, winners, stakes winners, and graded stakes winners will be derived from all Northern Hemisphere racing. So the sires list will give a stallion credit for a stakes winner in Japan or Ireland, he just won’t get credit for the earnings. Also, we’ll publish statistics compiled from flat racing only. Is it a perfect solution? No, but then there is no perfect solution when it comes to sires lists. Going by total winners or stakes winners favors stallions covering huge books of mares. Going by the percentage of stakes winners can favor a stallion with very small books that happens to get a few minor stakes winners. The Blood-Horse will continue to publish its variety of lists including our international list, which combines all racing in the Northern Hemisphere. We feel it is time, however, to make the general sires list more relevant by eliminating the exceptions. 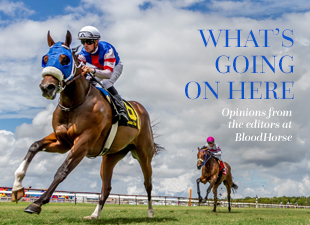 If you have a strong opinion for or against, then write to me at emitchell@bloodhorse.com, leave a comment on the “What’s Going on Here” blog on BloodHorse.com, or send a tweet with the hashtag #bhsirelists.